The One and Only Ivan by Katherine Applegate. Grades 4-7. HarperCollins, January 2012. 305 pages. Reviewed from ARC provided by author. Ivan spends his days in his domain at the Big Top Mall, watching TV when someone turns it on, eating, and sometimes drawing. Ivan has friends - a dog named Bob and an elephant named Stella who lives in the domain next to his. Everything changes when a baby elephant is brought to the Big Top Mall. Ivan knows he must protect her. He knows he must save her. 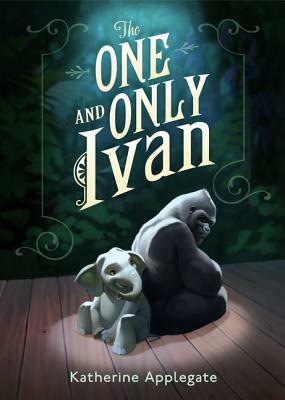 The One and Only Ivan is a book that broke my heart, and it's also a book with a lot of hope. It's written almost in verse, almost in prose poems, just the way you'd think a gorilla might narrate his story. The writing is what drew me into the story. As Ivan is relating his situation, he'll suddenly throw in there a little flash of what his life was like before. Just a little flash, a pinprick of something painful that you know has happened to him. But he's not ready to share everything yet. The pacing is spot-on and the story unfolds in its own time. This is maybe not a story for your more sensitive young readers. There are some harsh realities of how animals in captivity are sometimes treated, but it's clear that this reality is not the only way that animals in captivity are treated. Katherine Applegate includes an author's note that explains how the book was inspired by a true story of the real Ivan who now resides at Zoo Atlanta. I'd hand this book to kids who liked The Underneath by Kathi Appelt for its raw and tragic beauty. You may want to pair it with the nonfiction book Wild Animals in Captivity by Rob Laidlaw, which provides examples of both good and bad captive environments for animals. The One and Only Ivan is on shelves now!